Goal Zero has shipped a new outdoor portable speaker called the Goal Zero Rock Out 2. 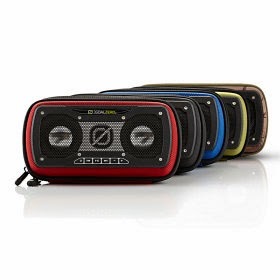 The speaker is water resistant, rugged and connects with a simple auxiliary cable into the headphone jack. In addition, it features a rechargeable 20 hour Lithium-ion battery and can be recharged either through the USB port or an optional Goal Zero Nomad 7 Solar Panel. It is aviable for 59.99 in a variety of colors. For more information follow the link www.goalzero.com/rockout2/ . Please check back for our full review! The Mini Computers are Coming!